Whether you’re at a work cafeteria or the dining hall in college, be careful of what you put on your tray. Cafeterias can be very tempting places with many different readily made options at your fingertips. There are usually different sections, with unhealthy comfort and classic foods being the most popular and well stocked. 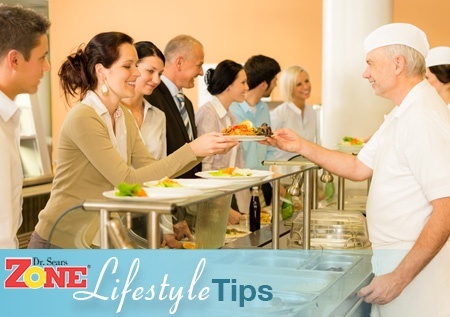 If you don’t know how to navigate the cafeteria correctly and control your cravings, you could end up with some extra weight to bring home. Before you go, drink up. Have a glass of water before heading to the cafeteria. You’ll be more full before going to get food, and will likely eat less. Remember to drink water while eating as well, to help with digestion and slow down your consumption, which will keep you from overeating. It’s also beneficial to drink water throughout the day to stay hydrated and avoid snacking; you may just be thirsty when you think you’re hungry. Sometimes, you’re not sure what you feel like, but you’re hungry, so you’ll load up your plate with whatever looks good. At times like these, remember to stick to the basic Zone plate with 1/3 of protein, 2/3 carbohydrates, and a dash of fat. There are always protein options. Go for fish or chicken if it’s available. Veggies are also always offered, just look for something that interests you; whether it’s a salad or something from the vegetarian section. You don’t have to fill your whole plate. Don’t try to fill your entire tray just because you can. Even though you may be hungry, you must also be realistic. If you load up on food, you’ll be more likely to overeat. Also, don’t go back for more food just because it’s there and you can. Try to sit somewhere far away from the food and you’ll be less likely to go back for seconds. Small portions of many foods may not actually be a good idea. Although you may think your small samples are a great way to try numerous different foods and be healthy, it is actually worse for you if you aren’t careful. It’s a sneaky way of adding more food onto your plate, and eating more calories and possibly messing up your Zone Diet if the assorted foods don’t have the right proportions. Try to remember and track what you’ve been eating throughout the week. Avoid the fried foods, pastas, and pizzas! I know they are tempting and right there, but try to stop yourself. If you occasionally have bad foods, keep track of when so you know it’s not becoming a consistent habit and then you can balance your day and week appropriately. Use the Zone Food Journal since it is a great tool for tracking, and you can also find out your recommended Zone Food Blocks and use that to navigate the cafeteria more easily. Treat yourself only every once and a while. Trust me I know it is hard, I have a sweet tooth so my biggest struggle was the table of desserts and tubs of ice creams that were always stocked. It will be impossible to eat perfectly, especially during stressful finals week or tough times at work, but if you balance and try to eat well most of the time, then a pizza or ice cream here and there won’t affect your weight.